… to convicts who have passed two years of their sentence, and not misconducted themselves. In cases of convicts misbehaviour, mild and persuasive means of correction are first tried. If such fail, the punishments are reduction of allowance of provisions, confinement in a dark cell with no other food than bread and water, for not more than seven days; or by mulcting earnings; or moderate whipping, which, in any case, is not allowed to exceed twenty four stripes. 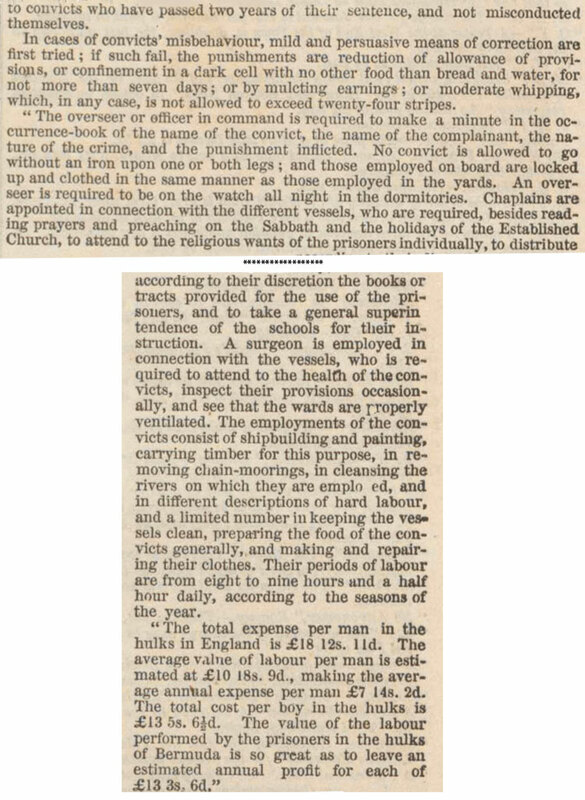 …according to their discretion the books or tracts provided for the use of the prisoners, and to take a general superintendence of the schools for their instruction. A surgeon is employed in connection with the vessels, who is required to attend to the health of the convicts, inspect their provisions occasionally, and see that the wards are properly ventilated. The employments of the convicts consist of shipbuilding and painting, carrying timber for this purpose, in removing chain-moorings, in cleansing the rivers on which they are employed, and in different descriptions of hard labour, and a limited number in keeping the vessels clean, preparing the food of the convicts generally, and making and repairing their clothes. Their periods of labour are from eight to nine hours and a half hour daily, according to the seasons of the year. 1. The overseer would submit quarterly returns to the Home Office (HO). These sworn lists of convicts give particulars as to the ages, convictions and sentences, health & behaviour of prisoners on board the convict hulks (until 1861) and are recorded in files at The National Archives in series HO 8. 2. It is worth noting that the date of this article (1846) is almost 40-years after the detention and transportation of James Butler and the other hulk refusers (1808). It is clear that by the mid nineteenth century prison hulks were seen as places of detention/punishment in their own right rather than as transitory holding places pending transportation. Although many prisoners did serve out their sentences on the hulks at the beginning of the century, it was always intended that they would only serve on the hulks for a limited time before being transported to the southern hemisphere.